A cookie jar mix is a great way to share your favorite cookies. Giving guests everything they need up front, from the ingredients to the recipe, is an incredibly personal way to thank guests. 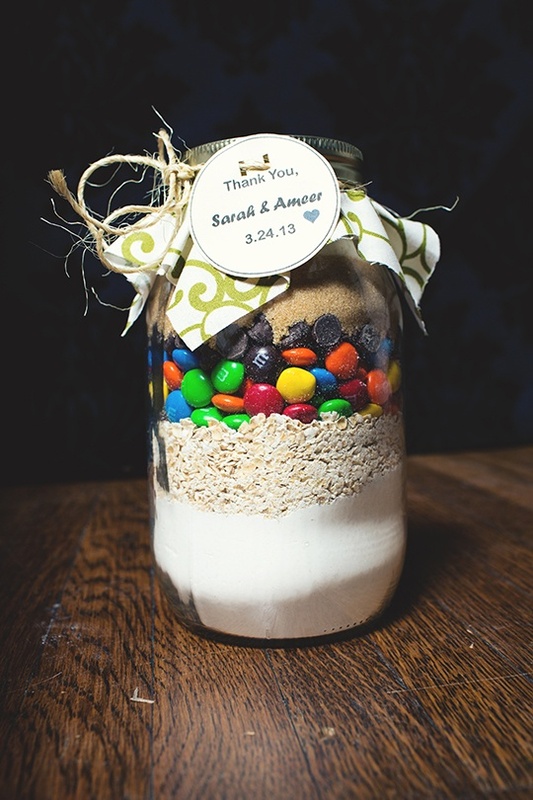 Layering the ingredients and accessorizing the jar is a creative opportunity to incorporate color, style, or any other design element that you love. After the design is settled, it is much easier to add those little details that make a big difference. 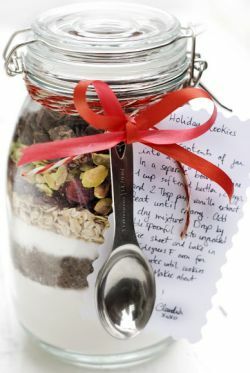 This wedding favor is a delicious take home treat for guests and it is quite possible that the recipe attached will become a treasured keepsake used many times over. 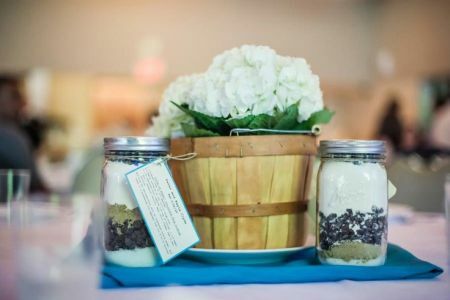 A creative cookie jar mix display is a great way to intentionally draw guests in and provide an interesting focal point during the reception. 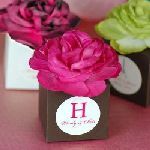 Once the wedding favors are noticed, you have the opportunity to give guests something delightfully unexpected. 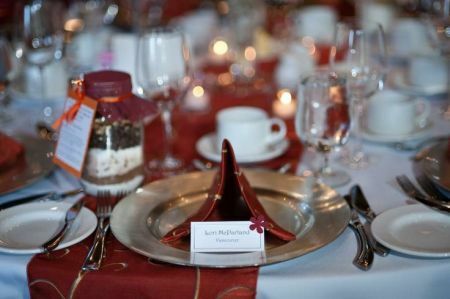 When the wedding favor gets the chance to grace the table, beautiful things happen. 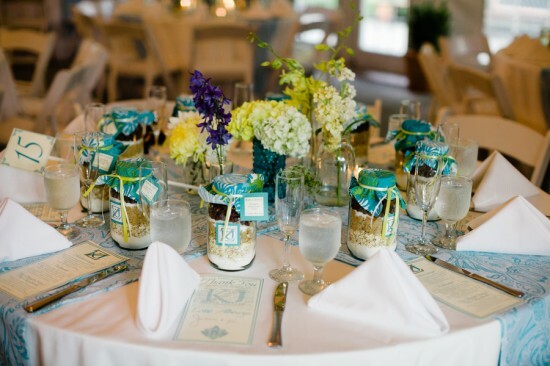 This cookie jar mix blends effortlessly into this beautiful tablescape. 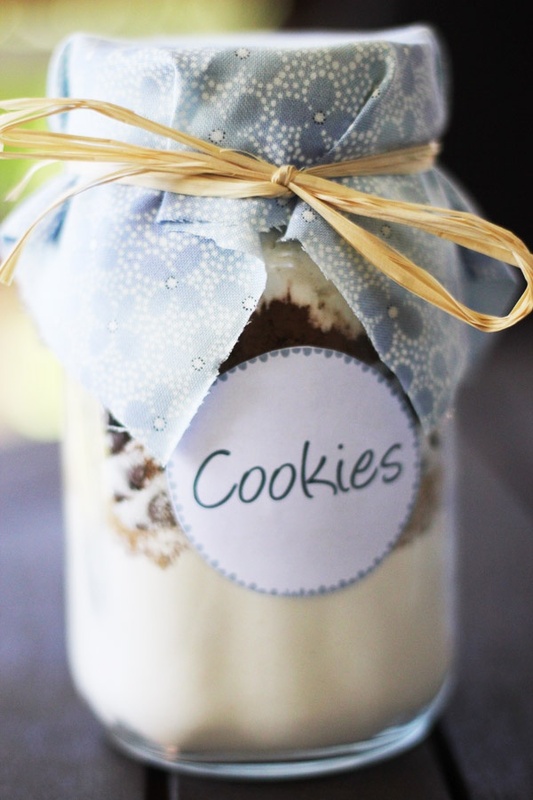 This beautifully presented cookie jar mix is all dressed up and ready to go. The secret lies in the decorative details, from the hand tied bow to the personalized tag. Vintage as sweet as can be. 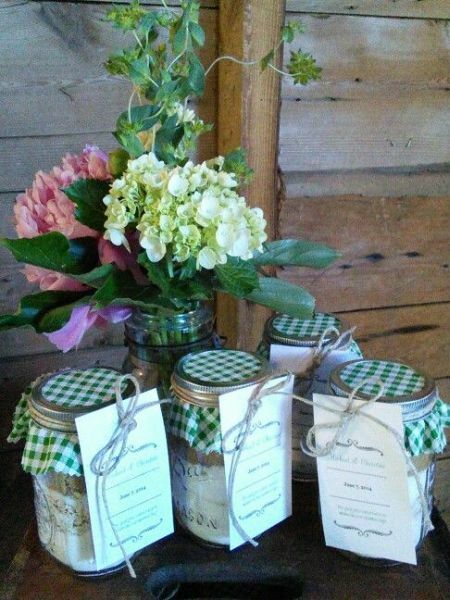 This wedding favor display reflects the best of vintage and it couldn't be simpler to achieve. 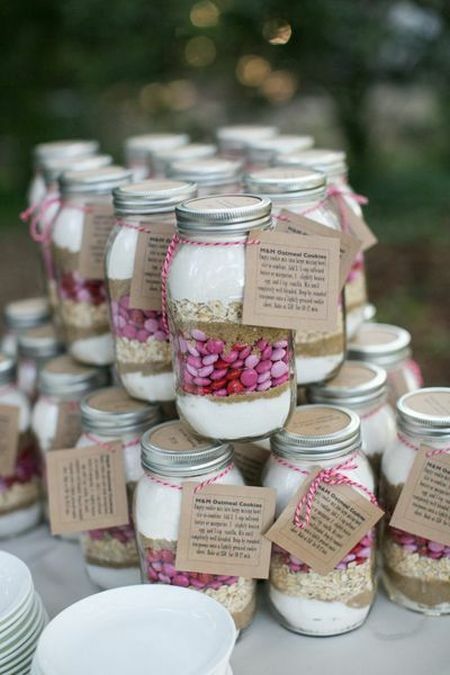 It's all about Mason jars, from the lovely flowers to the beautifully accessorized cookie mixes. Sometimes color is just the thing to provide optimum visual interest. 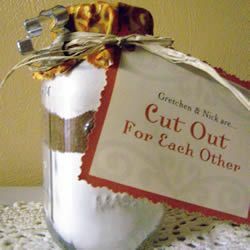 Here, the jar lid provides that one burst of color that ties it all together and gives the wedding favor the look and feel of belonging. This simple gesture if so easy to create. 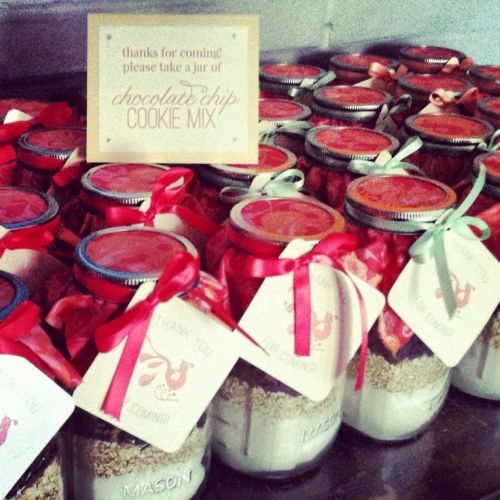 Offering guests a variety of cookie mixes with unique adornments is a special way to say thank you. Share your favorite cookie recipe. Attaching the recipe for your take home cookie favor is the perfect finishing touch. 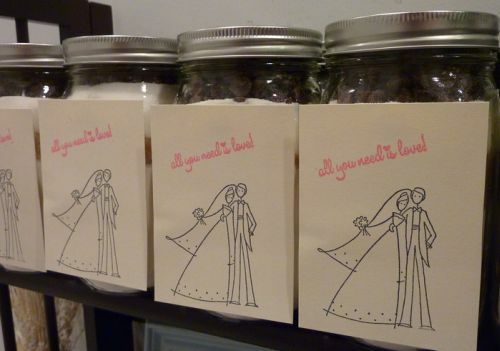 Guests will notice your wedding favors with this sweet sign. It is important to define the purpose of your cookie jar mixes and this one does it ever so sweetly. 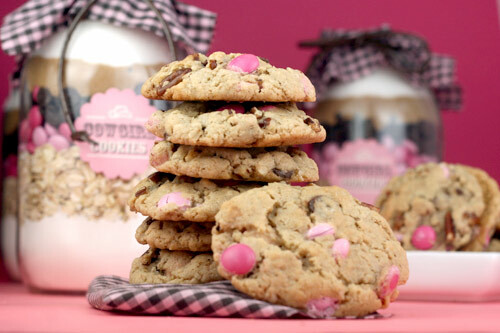 These cookies just got better with the addition of chocolate candy. We love how the pink M&Ms brings another color opportunity to enhance your wedding scheme. 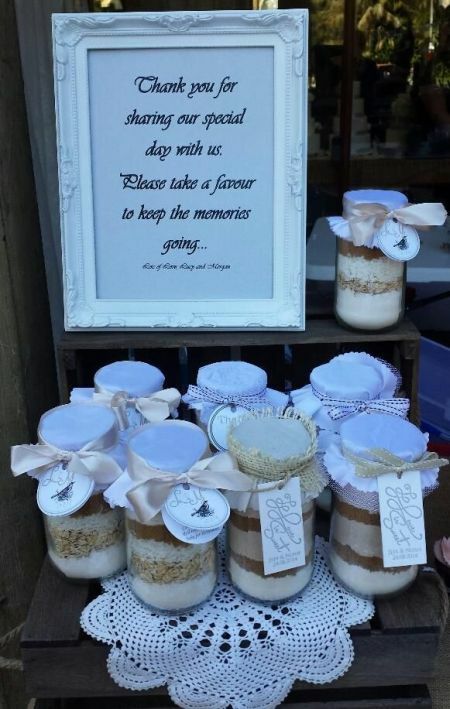 Add a personal message expressing your appreciation or design a self stick label for the jar. All you need is love and a great cookie mix. 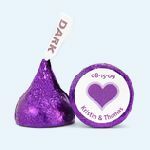 Other meaningful wedding phrases could include "Sweets from the Sweethearts" or "Love Beyond Measure." All the elements of this favor display work together to express the theme of the wedding. Coordinating the candy color to the cord used to attach the recipe card creates a cohesive look. For the love of cookies. 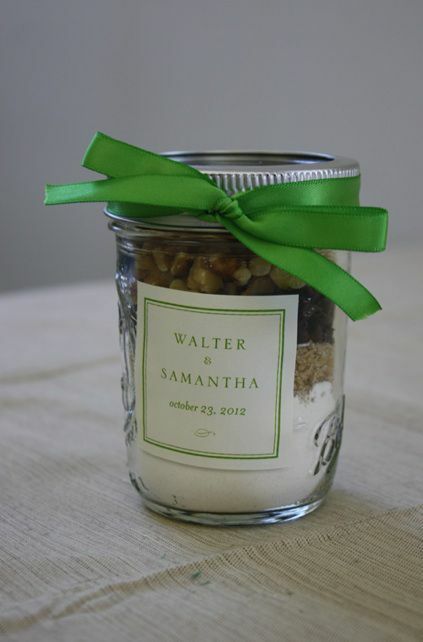 This holiday cookie in a jar was made as a Christmas gift, but it is also the perfect favor for a December wedding. 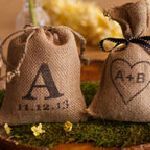 It could also be easily customized to any season with a change of ribbon and blissful wedding message. Attaching a heart handled whisk, measuring spoon, or cookie cutter only adds to the creativity. 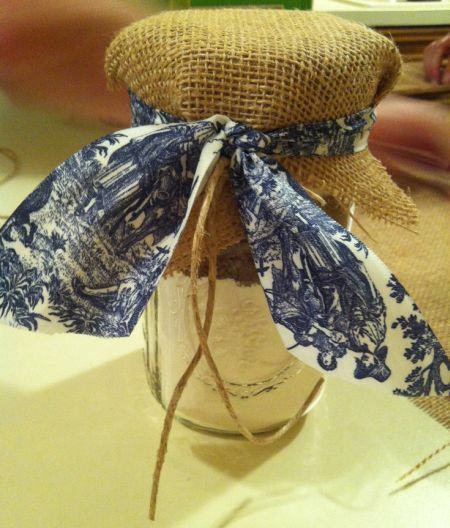 For a fresh updated twist, add burlap to your cookie jar. 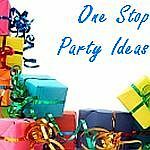 You can then liven it up with vivid bright colors or subtle touches of color in ribbons or fabric. Mix flour, baking soda, baking powder and salt. Pour this mixture into the bottom of the jar using a funnel to prevent any spillage. Press layer down and then add chocolate chips. Next, the white sugar is added into the jar followed by the brown sugar. Seal the jar with a lid. 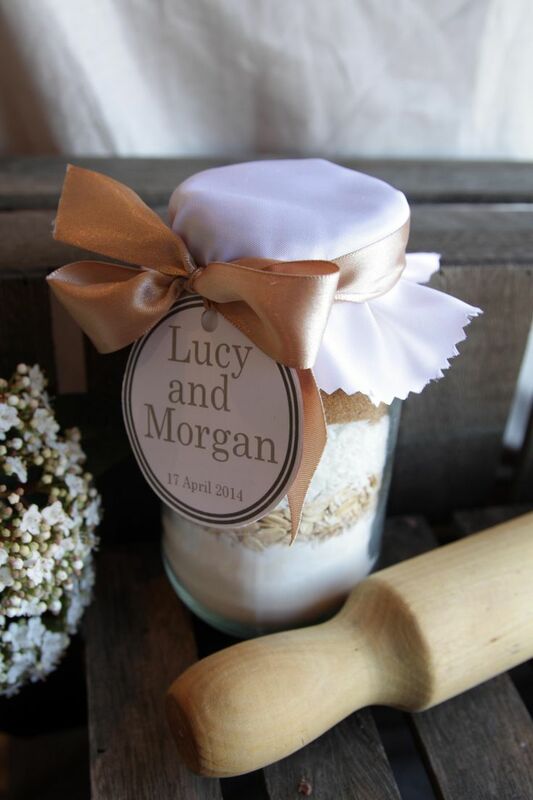 You may add a piece of fabric to the top of jar and secure with a rubber band or decorative ribbon. Preheat over to 375 degrees. Mix 3/4 cup butter, 1 egg, 3/4 teaspoon vanilla flavoring in a bowl. Add this dry cookie mix. Drop rounded teaspoons onto a baking sheet. Bake 8 to 12 minutes. Cool and enjoy.